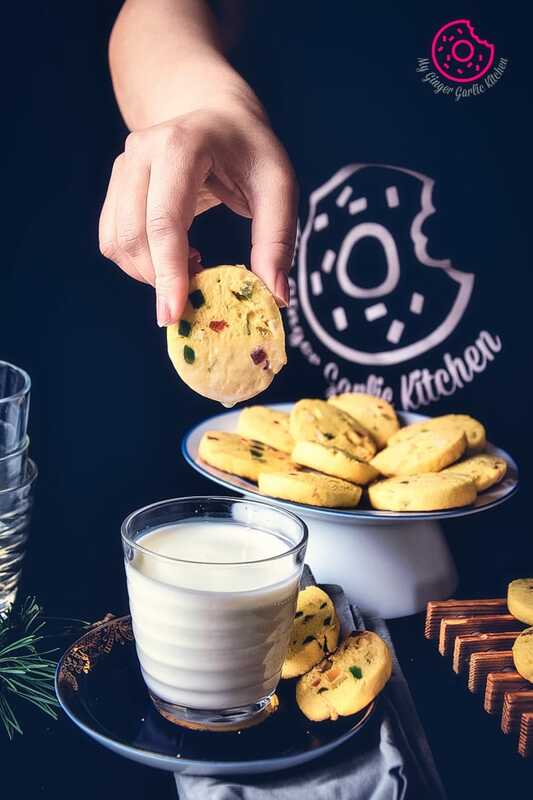 Learn to Make Eggless Tutti Frutti Cookies Recipe — Karachi Biscuit Recipe with the step-by-step video tutorial. 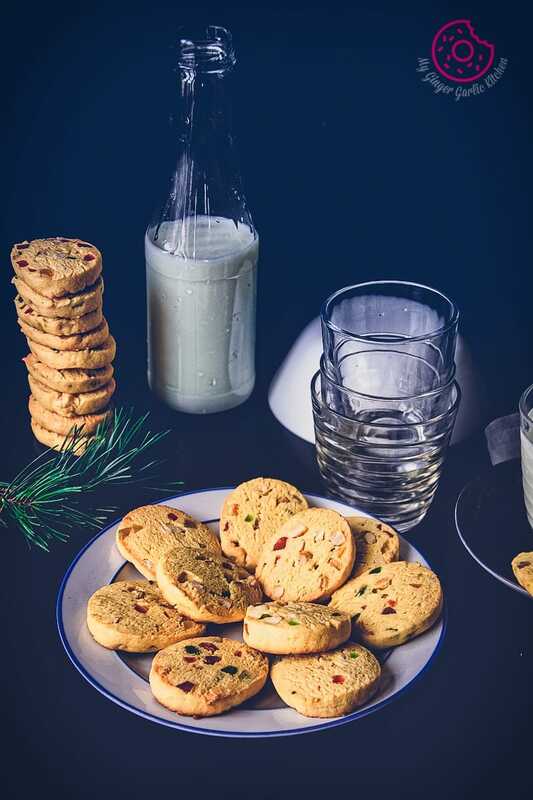 These fruit biscuits or cookies are one of the most crowd-pleasing tea time biscuits in India. These eggless tutti frutti cookies are full of colorful and splashy tutti frutti. Don’t the colorful candied fruits look like tiny jewels? Not to mention that these fabulous looking biscuits make phenomenal gifts at the time of festivals and celebrations. 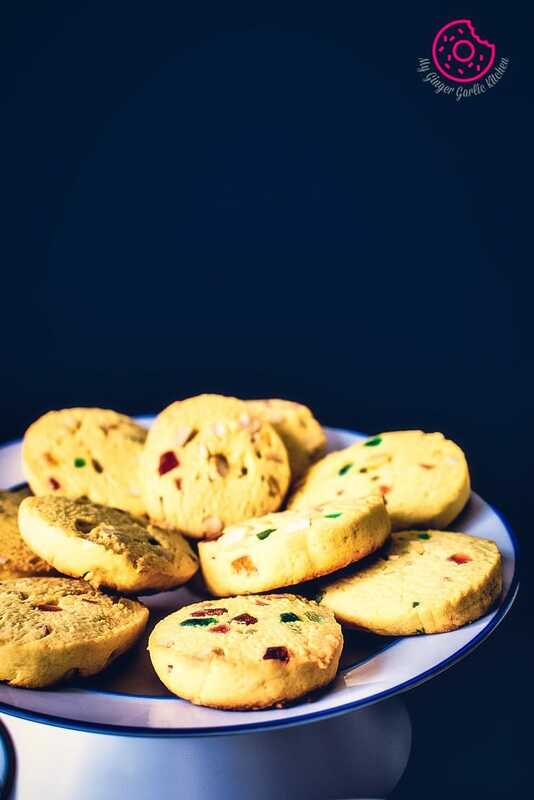 Today I am sharing Hyderabadi Style Eggless Tutti Frutti Cookies. As said, these cookies are also known as Karachi Biscuits. 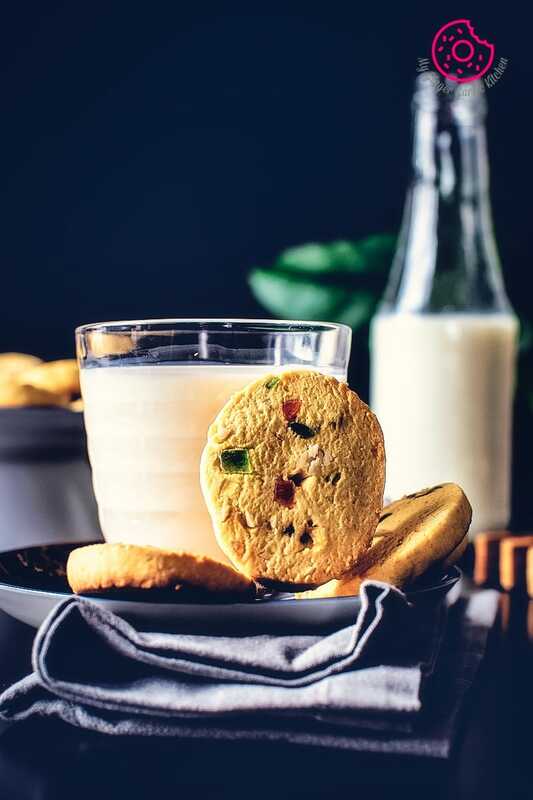 These eggless cookies are packed with hued tutti frutti, cashews, vanilla custard and perfectly balanced with the flavoring of pineapple essence. 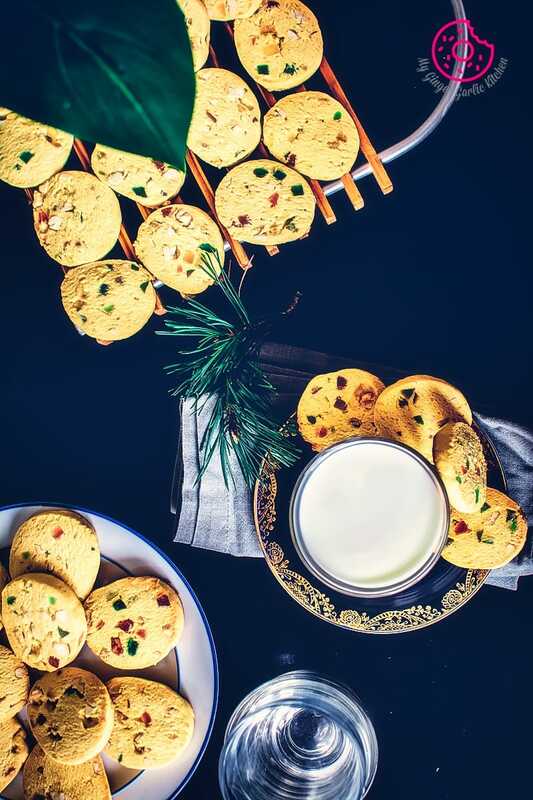 In my earlier post about chai, I have already told you that chai + biscuit is one of the most favorite combos for Indian People. Yes, people live and die for milk tea in India. The early morning starts with chai + biscuits. 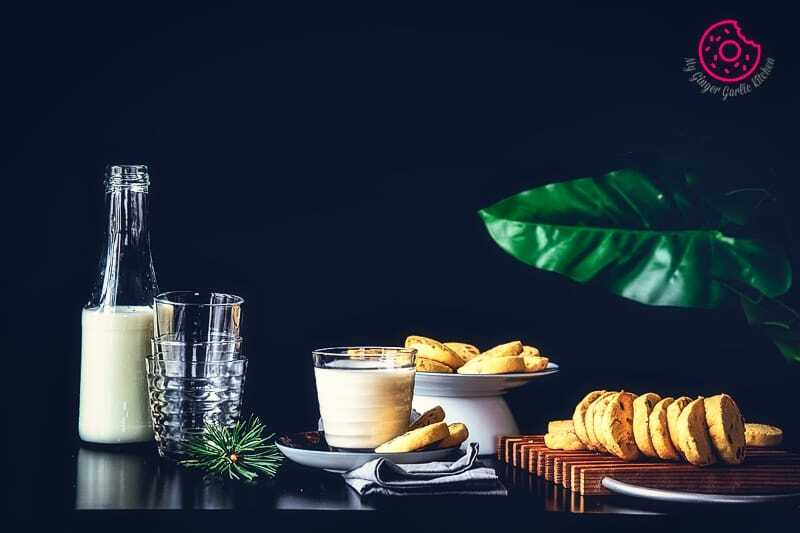 Some tea lovers do believe that if they don’t start their day with chai biscuit they have a terrible headache, they feel dull, sleepy and much less energetic. Well, I don’t know how true it that because I am not a daily tea person. But yeah, I do love to start my mornings with a steaming cup of hot coffee during winter, autumn, and spring. Furthermore, some kind of cookies and Indian biscuits are a must with my coffee. During summers, my favorite way to start my day is with a chilled and refreshingly delicious cold coffee. Speaking of summer, sometimes it is indeed hard to conclude that we are already into the last days of May. Where did all these months go? Sure thing, time is moving fast. But I am so much loving the fact that past 10 days here have been tremendously warm. This current pleasant weather is offering just the optimized kind of warmth I crave for. It is still not officially summer yet, but this feeling of summer is just ‘WOW’. Who wouldn’t love the bright and dazzling sunlight, sunny blue skies, lush green trees, and blossoming flowers? I love consuming dishes made with tutti frutti. This love-affair started during my early childhood. Be it a tutti-frutti cookie, fruit cake, tutti-frutti ice cream, Christmas cake, or any similar item. Mmmm, the fresh baking aroma coming out of these delicious cookies is just beyond description. I used to love the scent of bakeries, and I still do. Nothing can beat it. 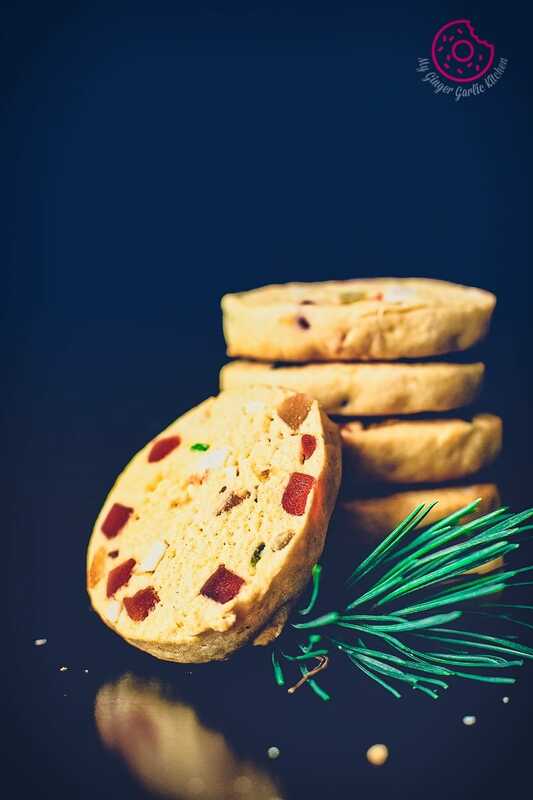 I can still recall those memories when these tutti frutti cookies were a favorite during every visit to the bakery shop. So, if you are having trouble keeping the kids busy during summer breaks, then baking is a perfect solution for you. This way they will be busy. At the same time, they will learn the baking skills. This summer, I am planning a lot of baking with my little one. Tutti frutti is simple candied dried papaya which is generally used in baked food and desserts. Primarily, Tutti frutti is candied dried papaya. Making your own tutti frutti is a piece of cake. You can easily make tutti frutti at home if you get raw papayas where you live. However, I don’t get raw papayas here, so I always buy my store-bought tutti frutti. You can find these at any local grocery store. Making these cookies is pretty simple and straightforward. Sift these ingredients: flour, custard, baking powder, and salt. Add cashews and tutti frutti, Give it a mix. Cream together butter and sugar. Add dry ingredients, milk, and essence. Make a cookie dough. Roll. Wrap. Chill. Cut. Bake. DONE! Generally, these cookies are made using all-purpose flour aka maida, but you can replace this with whole-wheat flour. I have added pineapple essence to these bakery style cookies, but you can also add rose essence to these. You can store these crispy and melt-in-mouth cookies in an airtight container at room temperature for about a month. Chilling is recommended because this step ensures that you get nice flaky cookies. You can chill the dough for 4 hours or more. 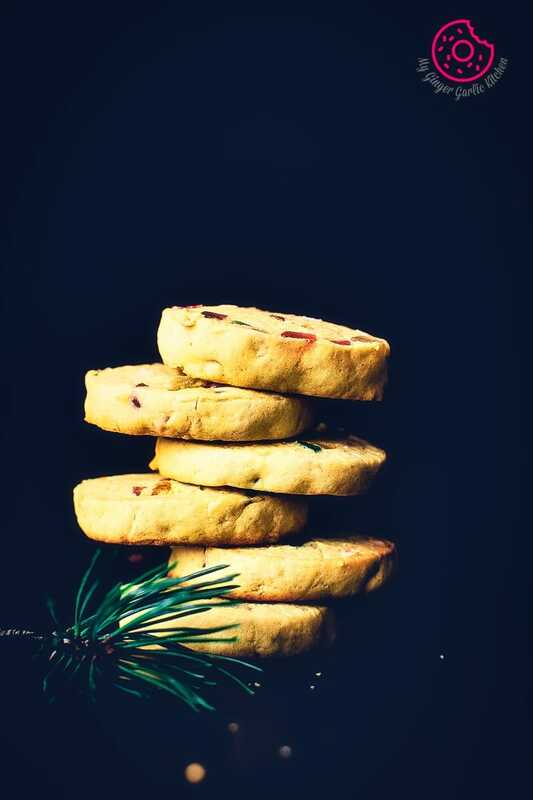 These fruit biscuits or cookies are one of the most crowd-pleasing tea time biscuits in India. These eggless tutti frutti cookies are full of colorful and splashy tutti frutti. Don’t the colorful candied fruits look like tiny jewels? Not to mention that these fabulous looking biscuits make phenomenal gifts at the time of festivals and celebrations. 1. In a mixing bowl mix sift together flour, custard powder, baking powder, and salt. 2. Add tutti frutti, cashews and mix well. Keep it aside. 3. Add butter and powder sugar to a large mixing bowl. 4. Cream together butter and sugar together. 5. Add the dry flour mixture, pineapple essence, and milk and mix till well combined. 7. Divide the cookie dough into 2 equal parts and roll them into logs. 8. Wrap the logs in a cling wrap and refrigerate it for 4-6 hours. 9. Preheat oven to 350°F/180°C. 10. Line 2 baking trays with parchment paper and set them aside. 11. Unwrap the cookie dough logs. 12. With a sharp knife, cut into 1/2 inch thick round cookies. 13. 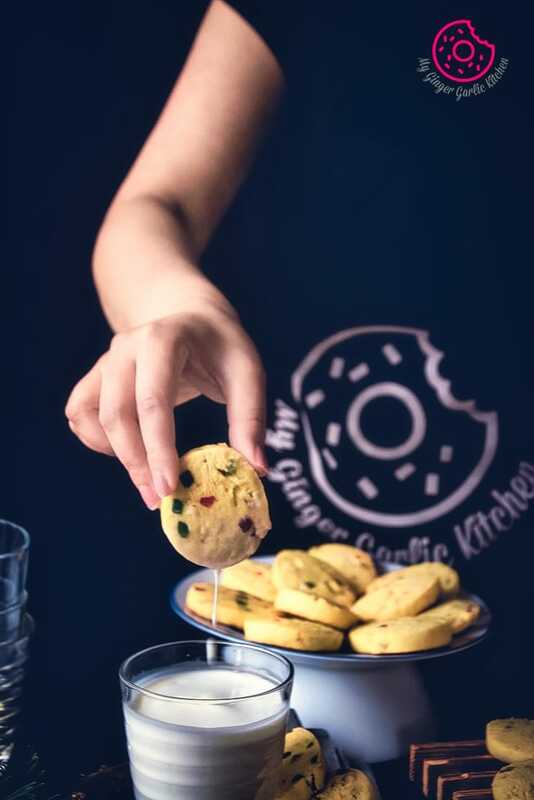 Place cookies on the prepared baking trays and bake them in a preheated oven at 180°C for 13 to 15 minutes. 14. Remove from oven and let them cool completely. 15. Delicious tutti frutti cookies are ready! 16. 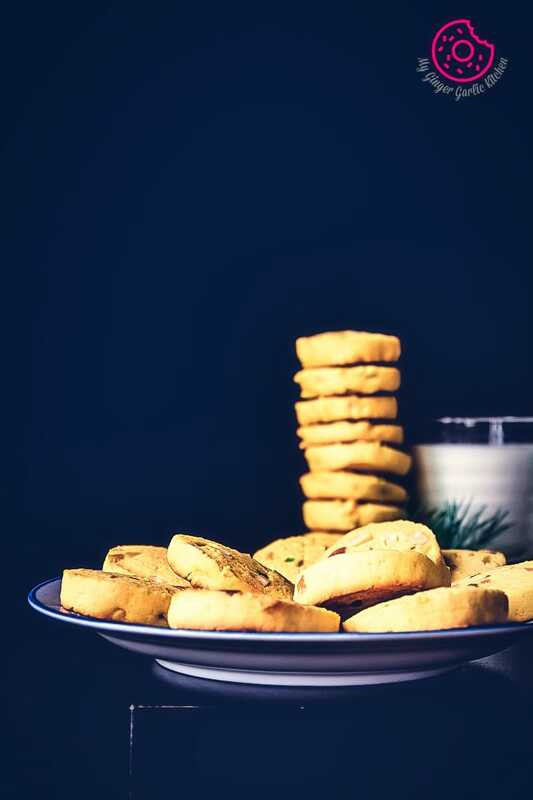 Store these cookies in an airtight container and enjoy them with a cup of tea, coffee or milk. 1. Generally, these cookies are made using all-purpose flour aka maida, but you can replace this with whole-wheat flour. 2. I have added pineapple essence to these bakery style cookies, but you can also add rose essence to these. 4. 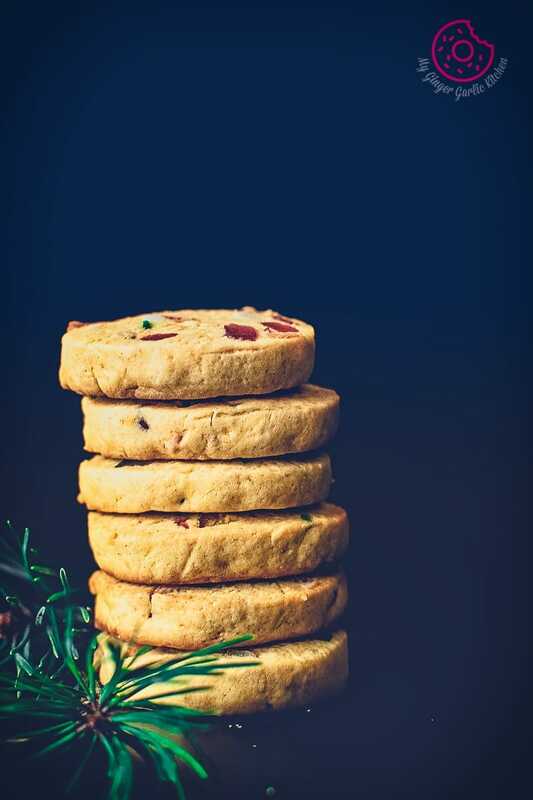 You can store these crispy and melt-in-mouth cookies in an airtight container at room temperature for about a month. 5. Chilling is recommended because this step ensures that you get nice flaky cookies. You can chill the dough for 4 hours or more.